One in four employees across the Middle East plan to watch the matches during working hours. Many senior executives plan to watch the games on company TV screens, while subordinates live stream on their smartphones. Some employees plan to leave work early, take annual leave or call in sick, in order to watch the games. 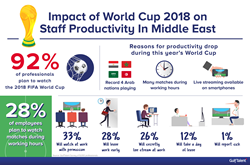 One in four employees across the Middle East plan to watch the World Cup matches during working hours. 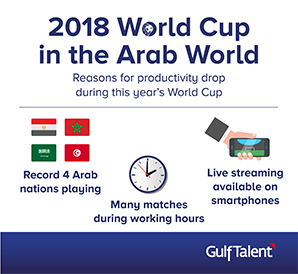 Employers across the Middle East are set to witness a major productivity drop during June and July this year as a result of the 2018 football World Cup, according to a survey by online recruitment firm GulfTalent. The tournament, due to be played in Russia from 14 June to 15 July, will run each day between 2pm to 1am UAE time (1pm to 12 midnight in Saudi Arabia). Interest across the Arab world in this year’s FIFA World Cup is running high, as teams from an unprecedented four Arab countries have qualified for the international competition. The participation of Saudi Arabia and Egypt, including its star striker Mohamed Salah, has particularly heightened Gulf and Arab interest in the games. The presence of large numbers of expatriates in the region, many from countries represented in the tournament, is further ramping up excitement. The heightened euphoria around the games this year, combined with the fact that many matches will be played during Middle East working hours and can be watched by live streaming on smartphones, is set to make the impact on productivity particularly severe this year. 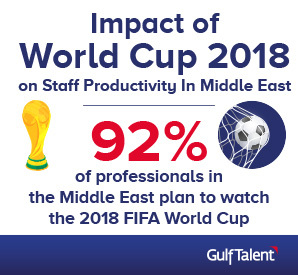 Based on GulfTalent’s survey findings, 92 percent of employees in the region plan to watch at least some of the games. On a gender basis, the percentage is slightly lower among women at 84%, as compared with 93% of men. Of the employees surveyed across the region 28%, or more than one in four, admitted planning to watch some of the games during working hours. Of these, roughly one third expected that they would be given permission to watch the games, while a quarter said they would secretly watch the games by live streaming them on their computers or smartphones. Other strategies employees reported they would use to watch the games during working hours, include requesting a full day of annual leave, leaving work early to watch the games, or simply calling in sick. When comparing across different job categories, Accountants were found more likely than others to secretly watch the games at their desk. Customer Service professionals in comparison were more likely than others to take a day of annual leave, while Civil Engineers were more likely to leave work early to watch the games. A further source of productivity loss identified in GulfTalent’s survey is late night game watching and after hours socializing. Almost two-thirds of professionals surveyed said they will watch the late matches even if it meant sleeping late. When asked how this would impact their work the next day, 74% of them said they will simply cut down on their sleep in order to get to work on time. A further 17% would go to work late, while 8% would take the next day off as annual leave, and 1% would call in sick. Interest in the games is not limited to junior employees. The survey found that many managers also intended to watch the games during working hours. Within this segment, senior executives and company directors registered the highest rate, with 32% of them planning to watch the games during working hours, as compared to an overall staff average of 28%. Unlike the non-managerial staff who mostly resort to streaming on their phones, a sizeable number of senior executives plan to watch the games on company TV screens. The survey also asked managers how much flexibility they would allow their subordinates to watch the games. Overall, 67% of managers said they would consider allowing their staff to watch some of the games, provided the workload was not too heavy. The survey found that managers who were themselves inclined to watch the games were more likely to give flexibility to their employees to watch them. Moreover, they were more willing to give their subordinates time off on days when their own personal favorite teams were playing. The threat to productivity is not confined to the Middle East. During the last World Cup, a survey involving 100 UK business leaders by telecoms and IT services provider Coms plc, estimated that the World Cup could result in a loss to British business of 250 million working hours. A separate survey by employment law specialists ELAS put the potential cost of the 2014 World Cup to Britain’s employers at £4bn in lost productivity. 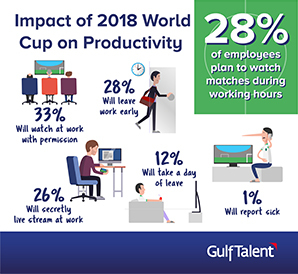 According to GulfTalent, given the nature of this year’s World Cup, the potential productivity loss is particularly high and Middle East employers with poor or inadequate guidelines are likely to suffer a disproportionate amount of absenteeism and staff distraction. However, only 16% of managers surveyed said their companies had a specific employee policy for the World Cup. Where policies had been setup and communicated, some consisted mainly of punitive measures such as stricter time and attendance monitoring, official warnings, potential salary deductions, and making up hours missed. Others reported more accommodating policies, such as giving employees time off if targets had been achieved, an ‘allowance’ of up to 3 early departures or late arrivals, giving permission to watch the games whenever the employee’s national team was playing, or even providing for collective game watching on company TV screens as a team building initiative. GulfTalent’s research was based on an online survey of 8,000 professionals based across ten countries in the Middle East and employed in different industries. Full details can be found on the company’s website: http://www.gulftalent.com. GulfTalent is a leading online recruitment portal in the Middle East, covering all sectors and job categories. Over 7 million professionals use GulfTalent for finding top career opportunities across the region. Over 9,000 companies use GulfTalent to source and hire qualified professionals, including both local and expatriate talent.